Nothing says fun like a barnyard birthday - especially when the little boys mom is super excited about sugar cookies! 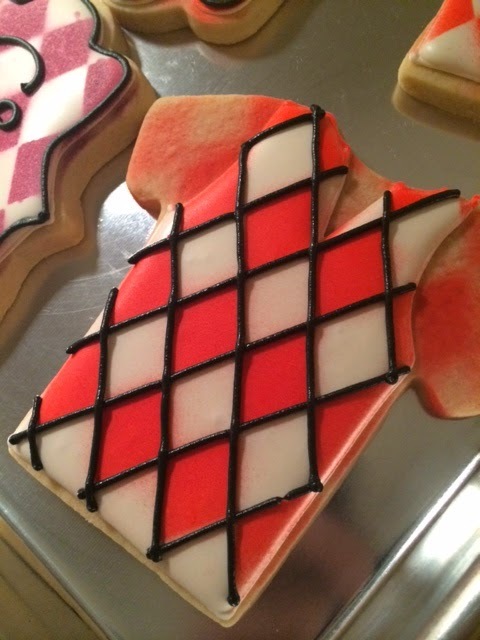 When she asked me to make cookies her only request was to make any cookies that fit in a farm theme, but there had to be a few pig cookies! 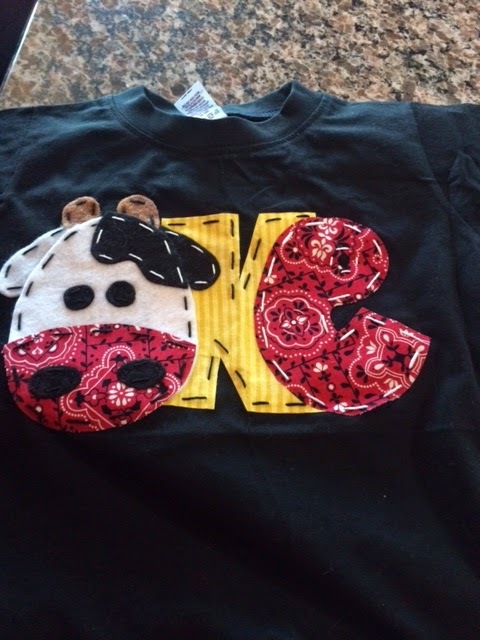 She also sent me two pictures of the shirt made for her son's birthday - which was awesome inspiration! It was easy to find cookie cutters to use for this order - my only trouble was picking a few! I ended up with a barn, cow (made from a reindeer cutter), pig, plaque cutter (made from a fancy number zero) and the letter C. To tie everything together I kept with the same color pallet. More cohesive. At least that was my plan! 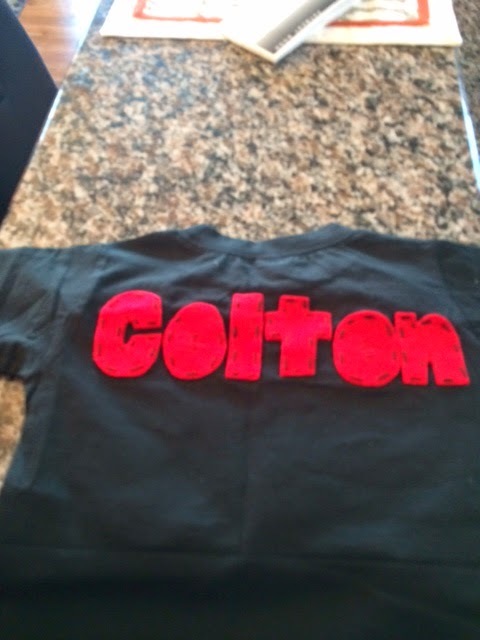 And hopefully Colton and the rest of his family will enjoy them at his birthday party this weekend! Happy Birthday Colton - thank your mom for getting these cookies! Good friends of ours return every spring to Western Nebraska for her family's branding. 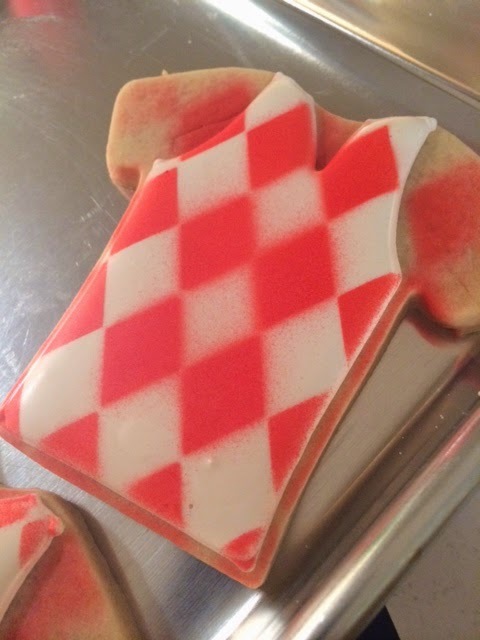 And what doesn't say fun like sugar cookies at branding? 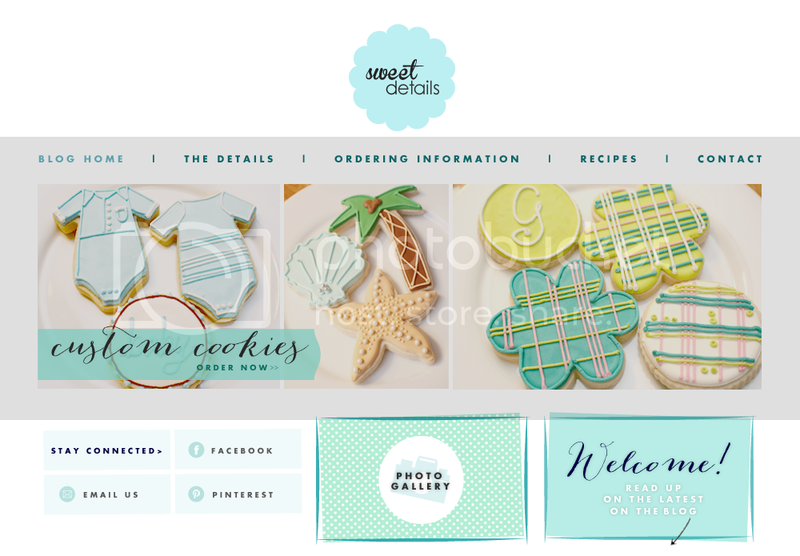 They may have had a gift certificate for two dozen cookies that they wanted to use up too - but we'll go with the first part about how sugar cookies and branding go hand in hand. The only request they had was to incorporate her family's brand into the cookies. And let me tell you it was fun to make some western cookies. I chose to do a cowboy hat, cowboy boot, plaque cookie and the letter H (the family last name starts with H). I mainly wanted to try out painting on a wood grain to some of the cookies. So I flooded a base layer of cream on the plaque and letter H cookies. After letting those dry overnight they were ready for my attempt at wood grain. I had meant to take a picture of the the paintbrush I used, but as you see I didn't. I just took a new paintbrush with wide bristles and did a little cutting and ripping out of some of the bristles to make it look ratty. Then with a little food coloring and some water mixed in a bowl I was ready to paint...and say a few prayers. I dipped my paintbrush into the paint, then dabbed off most of the paint onto a paper towel and then started dragging it across the cookie. I decided to start in the middle of the cookie - and I have no reason why. I just did. Then I just kept dragging over and over. And voila! The cookies had a wood grain effect. Same thing with the letter H cookies too. After I got going it was pretty fun. The end products were pretty nifty. Letter H's were decorated with barbed wire. The crowning glory of brand cookies. Yes, it's a cattle brand. Really. Not too shabby. And I'm thinking the cookies went over well at branding. I mean everyone is hungry and who can resist dessert? Happy Branding Herian Family! Hope it went great! Easter was yesterday. I'm totally aware. How is this month going so quickly? It feels like it was just Valentine's day. Wow. This year, I was on the ball. 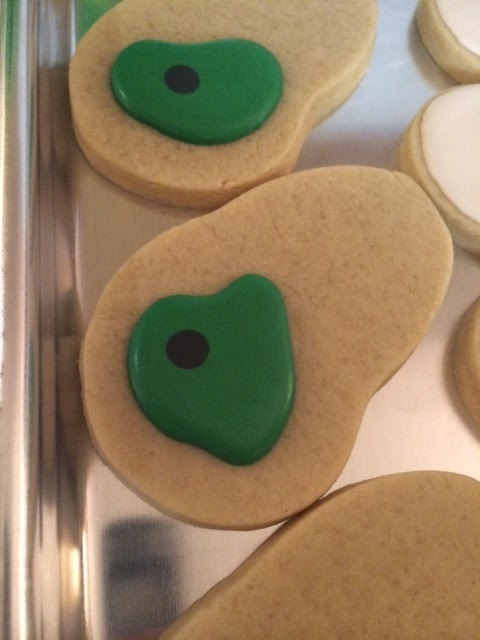 I made Easter cookies. I made lots o' Easter cookies. Mainly for a booth at a "spring fling" event the weekend before Easter, but it fed right on into the week before for people who wanted some last minute cookies! So to make lots 'o cookies I had to make lots o' frosting. I have been wanting to make Easter peeps, cookie form of course, and this was the closest cutter I had. And no Easter would be complete with carrots. Lots and lots of carrots. And from there I just tried out a bunch of different options! Here's the booth. It's pretty. With lots of levels hiding underneath all the fabric. I can make an 8 ft table work to hold 300 sugar cookies no problem. Challenge accepted. I'm proud to say all of the cookies were sold. Gone. It was great. 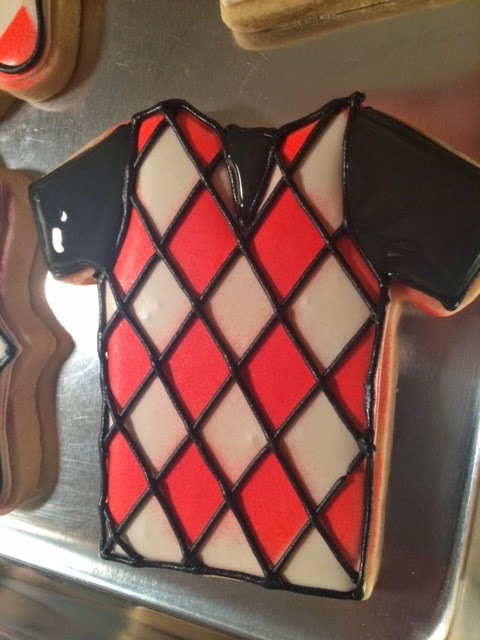 And hopefully everyone enjoyed the cookies! Happy Easter! Better late than never right? It seems like all I do is just put photos up with little or no explanation. And looks like I'm going to do that again. I had a bunch of orders this week. Cameras for a Photography studio opening, paintball cookies for a birthday boy, golf cookies for a Happy 4th Birthday celebration, and some Under the Sea cookies for a little ladies 3rd birthday. Phew. My hand cramps just looking at it all again!